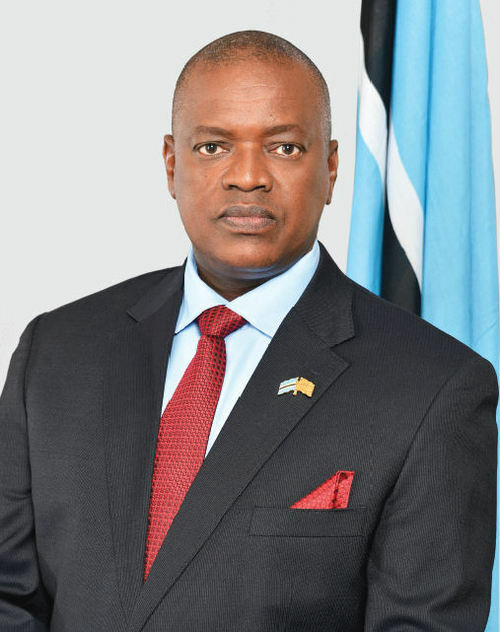 Botswana is a landlocked country in the Southern African region. It shares borders with the following countries: Namibia (west and northwest); Zambia (north); Zimbabwe (northeast) and South Africa (east and south). 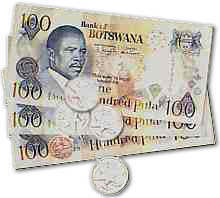 Botswana lies between 20 and 30 degrees east of Greenwich, and between latitudes 18 and 27 degrees south of the Equator. More than half of the country lies within the tropical zone, north of the Tropic of Capricorn. 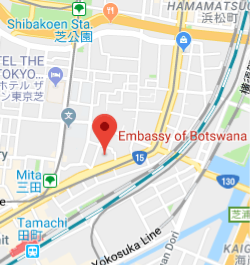 Roughly the size of Kenya or France, Botswana has a land area of about 581730 square kilometres. 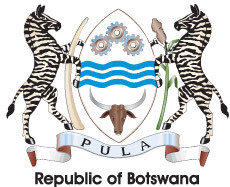 Three wavy blue bands in the centre representing Botswana's reliance on water. Three cog-wheels in mesh representing Industry. At the base a bull's head symbolising the cattle industry. Two Zebras, one supporting an Elephant's tusk,representing the natural fauna of the country. A head of sorghum representing Agriculture. The motto "Pula" means "let there be rain". The national flag has five horizontal stripes having colour from top to bottom as follows. 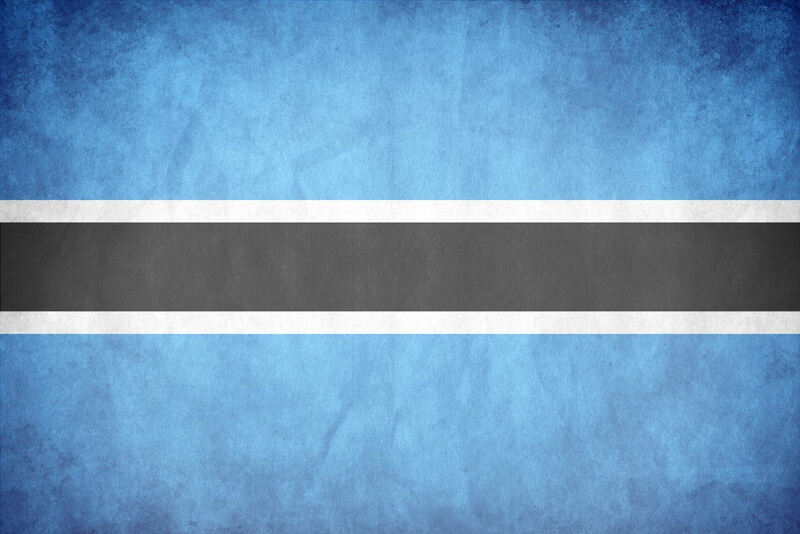 The blue colour represents rain and water, a rare commodity in Botswana. The black and white represents the racial composition of the nation. The northern part of the country experiences a tropical type of climate and thereby receives much higher rainfall per annum (500-700mm) than other regions. The eastern region has a semi-arid, sub-tropical climate with rainfall varying from 400-500mm per annum. The western region, covering the Kgalagadi Desert, is the driest part of the country with average annual mean rainfall less than 250mm in the extreme southwest. The rainfall season lasts from November to March, with January and February generally regarded as the peak months. October and April are transitional months. Almost all the rainfall occurs during the summer months (November-March) while the winter period (May-July) accounts for only 10% of the annual rainfall. The summer season is characterised by frequent rain and thunderstorms, very hot days and nights, usually cooling-off after the rain spells. Day temperatures can reach 35 degrees Celsius, or higher in some places. The heat is tolerable, due to very little humidity. The winters are dry and cold, especially at night. Winter temperatures can fall as low as 2 degrees Celsius, especially in the southwestern region. Occasionally, sub-zero temperatures may be recorded in the latter region. The major portion of the vegetation of the country is categorised as savannah, with numerous sub-divisions. There are special habitats such as the aquatic grassland of the Okavango Delta (northwest); the grassland of the Makgadikgadi salt pans (north-central), and the deciduous forests of the Chobe District (northern corner). Botswana is known for its abundance and variety of wild animals, which occupy the vast wilderness areas dedicated for their conservation. 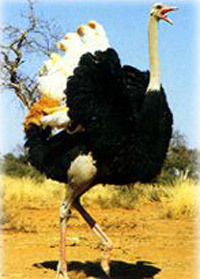 As a result, Botswana has often been described as the last great reservoir of plains game in Africa. 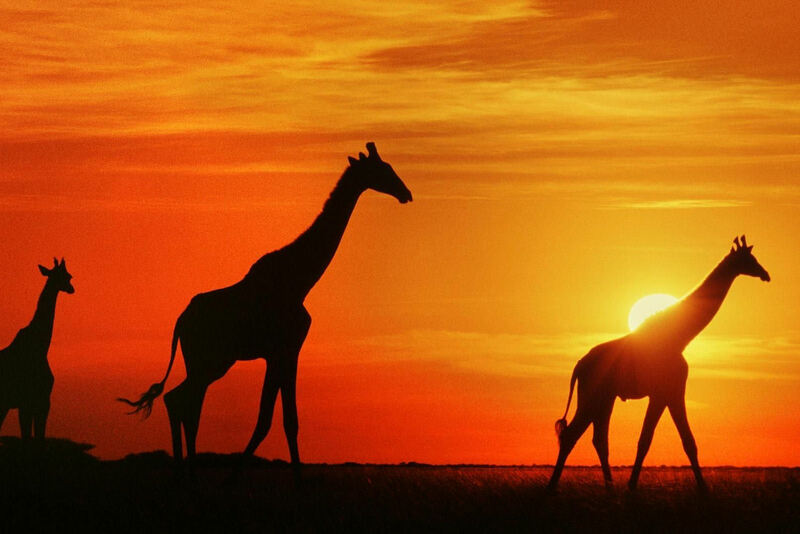 Most of Africa's large mammals are found here: lion, leopard, cheetah, elephant, giraffe, zebra, hippoppotamus, rhinocerus, African buffalo, hyena, and at least twenty-two species of antelope. Many species are abundant enough to be utilised as a source of meat, skins, and other useful animal products. Trophy hunting also occurs, and commercial management of wildlife has been introduced to gain sustained income from this resource. About 17% of Botswana's land area has been set aside for National Parks and Game Reserves. The elephant population is currently estimated at over 104 000, the largest in the world. The unit of currency is the Pula, which means, "rain" and "greetings". One hundred Thebe constitute a Pula. Notes are issued in the denominations of 10, 20, 50, 100 and 200 Pula. Money can be changed in towns, as banking facilities are very limited in the rural and main tourist areas. 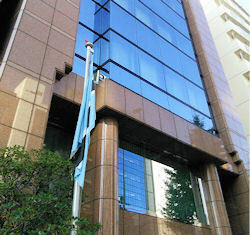 All lodges and hotels accept convertible foreign currency. There are also Bureaus de Changes at the border posts. Concerning foreign currency regulations, foreign exchange can be brought in and taken out on condition that it is declared upon entry in the country. There are no restrictions on the amount of traveler's cheques visitors bring in or out of the country. A maximum of P1000 in cash may be imported or exported by incoming or departing residents.